Mr. Hoesel is a new-to-me author, and I was quite taken with his storytelling. The book promised a lot of action, but started off slowly. Once it got started, though, it was hang-onto-your-hat time. It reminded me of that slow ascent on a roller coaster before the huge drop, twists, and turns. 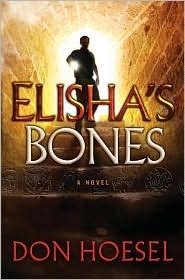 Elisha's Bones is a Jack Hawthorne mystery. The archaeologist is hired to find the bones of the prophet, Elisha, due to their ability to raise people from the dead. Jack never figured his life would be in danger on such an assignment. He and his former girlfriend, Esperanza, embark on a multi-continent search. One thing is crystal clear: There's no going back to his normal life as a college professor until the mystery is solved and those trying to kill him are brought to justice. I'm giving this book 5 Stars for its action and suspense. 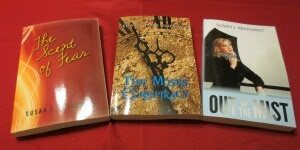 An Amazon search is in order for his other books (to add to my already long TBR list!). Disclaimer: I did not receive any payment for a favorable review. All opinions expressed, as always, are mine and mine alone. Writers and Readers: How long do you stay with a book that doesn't seem to be going anywhere in the first couple of chapters?